Tipper Gore Boots Dim Witted Climate Fraud Husband Al | Virginia Right! You really have to wonder how Tipper Gore could have stayed with husband Al Gore for so long. 40 years to be precise. With the mental intellect of a prairie toad and the monotone croaking that only other toads could possibly find charming, Tipper is a saint. Now that Gore’s Global Warming Climate Change hoax has been exposed and his financial future in the biodegradable crapper, Tipper has decided to move on to greener pastures. The divorce cites irreconcilable differences and a bovine-like flatulence on Al’s part. It is also reported that Tipper was very distraught at Gore’s inability to be exposed in an extramarital affair. Surely Al will find love again Some day. What an inhumane, childish reaction to a couple’s divorce. No wonder people think rightwingers are nuts. Well, Daganstein. I wonder what your reaction was to all your fellow leftists that wished Cheney ill during each heart episode, or left wing kook Bernstein that promised Sarah Palin would be gang raped in New York. Al Gore lied about inventing the Internet. Al Gore lied Love Story being written about he and Tipper. 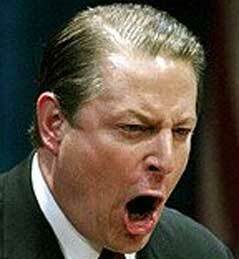 Al Gore not only lied about the now debunked myth that the earth was warming due to man. Turns out, Gore invested heavily in companies that would benefit by his lies. He should be on trial for this fraud. And now his lies have come home to bite him. Funny? Sure. If you check the category, this was posted as humor. I am NOT a Reid fan, but unlike you lefties, I do know that wishing Cheney to die, or Palin to be raped crosses the line. But your only problem with the post was the fact that you are a Warmer, bitter about the failed fraud. All I can say for Gore is, it’s karma. He has screwed so many people with his greed that any personal misery he receives out of the divorce is his own doing. It would be a great and just day indeed if he were left penniless in a Divorce court. The man that has pushed so hard to make a fortune off of the backs of the poor by forcing massive energy taxes and mandating new, and more expensive technology on the world just so he can make millions. But out of 332 people to read this post here, and another 870 here http://beforeitsnews.com/story/70/852/Tipper_Gore_Boots_Dim_Witted_Climate_Fraud_Husband_Al.html you are the only one that fails to see the humor. My one question… under American law must there be some kind of financial disclosure of assets? For settlement reasons? Are or can they be made public? How does American law view this? @Jeff – I am sure the Gore-ish details will be private. They are both private citizens and not subject to any disclosure I am aware of. They will probably work out a deal they can both live with. Talk about “climate change.” Al found out that Tipper voted for W in 2000. According to his friends, he’s still a pot-head. I used to think like an idiot when I smoked it too. What a screw-ball. @JSRose – Pothead? That explains a lot. His son was busted for weed in 2007. Seems he was speeding in a Hybrid Prius. Must have been that Toyota accelerator problem, huh? It’s sad about Al and Tipper Gore’s split up. I am sorry to hear it. I wish them both a personal best and pray they’ll find their way back together. Thanks for the answer Tom. As much as I loathe Al Gore, I agree with Sandy. 40 years is a lot of water under the bridge.